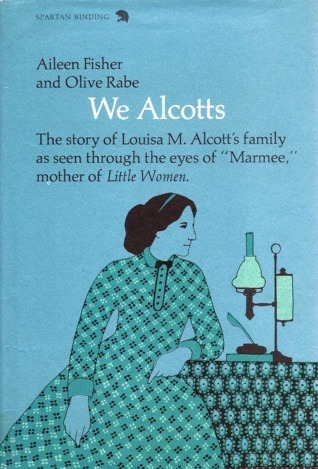 We Alcotts is a nonfiction narrative written by Aileen Fisher and Olive Rabe in the voice of Abba May Alcott, better known as Marmee from Little Women. It traces the Alcott family history from Abba May's courtship with Bronson Alcott, through their marriage, the births of their daughters, and their many associations with transcendentalists, abolitionists, and writers as they moved from home to home in and around Concord and Boston, Massachusetts in the years leading up to and including the Civil War. The book concludes around the time of the publication of Little Women, with a brief postscript relaying the circumstances of Abba's death. I read Little Women for the first time last month, and I had a really hard time connecting with the first half of the book. Marmee and her girls felt too perfect to me, and I had difficulty seeing them as believable characters, let alone kindred spirits. My opinion improved as the girls aged in the second half (the part which is also known as Good Wives), and I ended up mostly understanding why the book is such a great favorite. As I was reading We Alcotts, however, I found myself enjoying the personalities of the real-life Alcotts much more than their fictional counterparts. Abba, for example, admits that her "desire to read sometimes made [her] resentful of seemingly endless household tasks." She also frequently suffers from worries and anxieties because of her husband Bronson Alcott's idealism and impractical faith that things will always work out. Though Bronson's faith is often proved right, I still really admired Abba's faithfulness and love toward her husband during the times she was most irritated with him. Despite his head-in-the-clouds approach to many things, I also kind of liked Bronson and his gentle quirkiness. The other thing I loved about this book is how it immerses the reader in the time period. Such figures as Ralph Waldo Emerson, Henry David Thoreau, and Nathaniel Hawthorne appear as friends of the Alcotts, and come across as warm and kind people, not just stoic historical figures. Though their writings and accomplishments are mentioned, this book concerns itself with their friendship and kindness more than their fame. I have never wanted to read any of their books before, but now I'm considering giving Walden a try. All the connections to Concord have also renewed my interested in exploring more of Jane Langton's Hall Family Chronicles novels. (Titles in this series that I have reviewed are: The Diamond in the Window (1962), The Fledgling (1980), and The Fragile Flag (1984). I'm undecided about whether it is imperative to read Little Women before reading this book. We Alcotts is easier to read and it deals with very little that actually happens in Little Women. It does give away the major death that occurs in Little Women, but I'm not sure how many readers in the 21st century go into that book completely unspoiled anyway. I can see We Alcotts being a valuable introduction to a variety of history topics for the upper elementary grades, and I think, for me at least, having the information provided by this book would have made me feel more invested in Little Women from the beginning. In any case, We Alcotts was a pleasure to read, and it seems like it will be inspiring some of my future reading choices as well.